Rep. Tina Pickett formally nominated Michael C. Turzai of Allegheny County to serve as Speaker of the House for the 2017-18 legislative session. This is Turzai’s second term as speaker. Pickett and Turzai both joined the House in 2001. 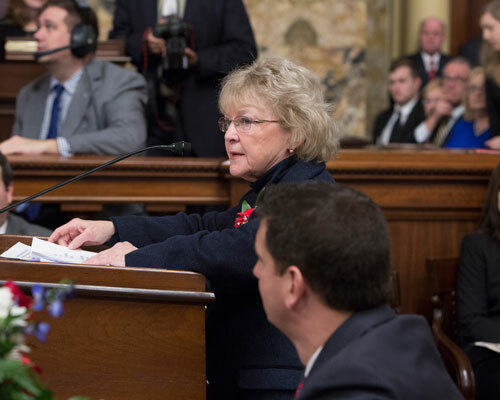 HARRISBURG – Taking the oath of office on Tuesday, Rep. Tina Pickett (R-Bradford/Sullivan/Susquehanna) began her ninth term in the Pennsylvania House of Representatives during a ceremony at the state Capitol in Harrisburg. “The beginning of each new session brings about much optimism in that we’re able to confront many of the issues impacting the people of Pennsylvania and, specifically, the residents along our Northern Tier,” said Pickett. “As we gathered to take the oath of office, we remain committed to making sure that our Commonwealth can attract good-paying jobs, our schools can provide the best quality of education, our government will only spend what it has and our taxpayers won’t be given a larger burden. During the swearing-in ceremony, Pickett also was given the honor to nominate Mike Turzai (R-Allegheny) for his second term as speaker of the House. Pickett pointed out that one of Turzai’s strengths is getting to know all areas of Pennsylvania so he can be an effective leader when presiding over the activities of the House. Tuesday’s swearing-in ceremony marks the beginning of the 2017-18 legislative session.